Features 2 deep front patch pockets, a scissor pocket, right hip pocket, and instrument loop. I.D. badge loop and back yoke with locker loop. Front and back side panels are in a soft, stretchy knit for extra comfort and a flattering fit. 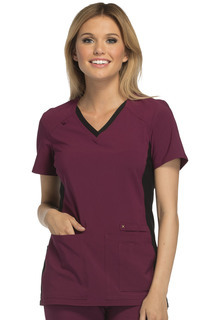 A Contemporary fit V-neck top features two front patch pockets, a scissor pocket, right hip pocket, and instrument loop. Also featured are an I.D. badge loop and back yoke with locker loop. Front and back side panels are in a soft, stretchy knit for extra comfort and a flattering fit. Center back length: 26"